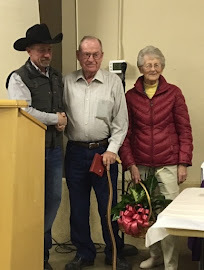 We appreciated the support we received from our friends & neighbors for our Bull & Female Production Sale held on March 16, 2013 at the Burley Livestock Auction Yard. We felt the day was a success and are always looking for ways to improve and do better next year. We are positive about the direction Barker Cattle Company is headed and look forward to continuing our tradition of quality. Please come visit us at the Ranch any time! Many Thanks to the good help we had from our Families! We couldn't have done it without each one of you. The three Partners! Ruel, Tom & Tyler. Barker Cattle Girls Going to Town! These are just a few pictures of the heifers we're offering in our sale, Saturday, March 16 at Burley Livestock Yard. You need to come check them out and see for yourself the quality that we're offering. Over 80 bulls videoed and will be posted to the website soon. Thanks to Nathan Bushman for his help and the rest of the crew pictured above. Nathan, Kamri, Tyler, Logan, Call, Tom & Bowdrie. Getting excited to showcase this super set of bulls! !